Finding or observing a rare or uncommon plant or animal is one of a naturalist’s greatest joys. I for one have spent many hours searching high and low for rare birds, herps, and insects. However, many times rarities turn up when you don’t expect them and sometimes they are found by the unsuspecting. One such find happened on September 28, 2009 at the Delaware Nature Society’s Burrows Run Preserve in northern Delaware. During the “Life of the Monarch Butterfly” program being taught that morning to students from The Pilot School, one of the children netted a butterfly that looked unusual to the Teacher-Naturalists (TNs) leading the program. One of these TNs, my wife Amy, realized that she had never seen this type of butterfly before and decided to keep it in the collecting jar until she could make a positive identification. Moments after the school group left the preserve, Amy and fellow TN Judi VanderWerff were able to match the butterfly to one in Elton Woodbury’s Butterflies of Delmarva field guide. 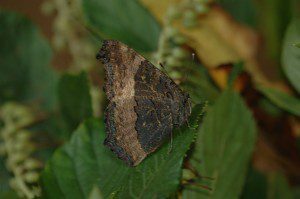 And sure enough, it was a butterfly very rarely encountered in our area, called a Milbert’s Tortoiseshell Nymphalis milberti. 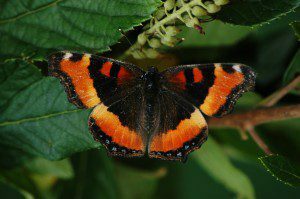 This handsome butterfly is mostly dark on the upperside except for a wide, bright orange band near the outer edge of the wings. It typically ranges well north of Delaware, usually in the mountains, and also in the western U.S.. Considered a stray in the mid-Atlantic region, this individual possibly was blown down from the Appalachian Mountains. This great find brings the total number of butterfly species found at the Burrows Run Preserve to fifty-four. So stay alert and you may just be the one to find the next rare critter in our area! When standing in the frozen vegetable aisle of the grocery store, do you ever wonder where those vegetables came from and how they got into that bag? Delaware Nature Society members found this out out on a Delaware Agriculture Tour, Saturday September 19th. Anna Stoops, New Castle County Cooperative Extension agent and I led this exciting farm tour in New Castle and Kent Counties. The first stop on the tour was the Hanover Foods vegetable processing plant in Clayton, Delaware which processes those frozen vegetables and entrees you find in your local grocery stores. While visiting the plant, we were able to experience first hand, the extensive process veggies must go through before they come to your dinner table. Step 1: Farms across Delaware, Maryland, Virginia, and Pennsylvania contract with Hanover foods to grow lima beans, corn, spinach and other delicious veggies. Once ripe, these veggies are picked by the Hanover “picker” department (yes, such a department exists) and driven in Hanover trucks to Clayton. On average, 300,000-400,000lbs of lima beans are delivered per day to the plant (when in season). Spinach is the only exception as it is picked by the actual farmer instead of a Hanover picker. Step 2: Once delivered, the veggies (in our case we got to see lima beans) are taken off the truck and onto conveyor belts where they are first sorted by employees handling brooms which will separate the stems, dirt, and other debris found on the beans from the actual bean itself. 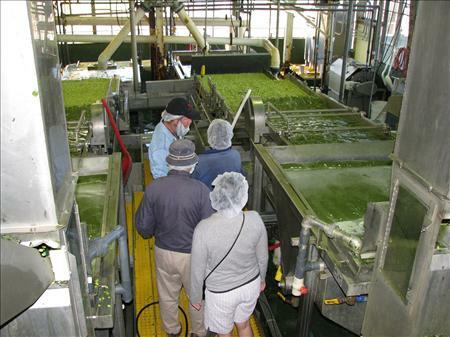 Bill Simpson, plant manager of Hanover foods in Clayton, DE, explains the process of lima bean cleaning and sorting. Step 3: The beans are then pushed through water for their first cleaning. Right after they are cleaned for the first time, there is a sorter system containing salt water. This salt water system separates green lima beans (they sink to the bottom in salt water) and white lima beans (which float to the top) into two separate piles. Step 4: The beans are again cleaned, sorted through by another set of employees and sent through an optical device which can “see” the bean and determine if it is rotten, unripe, or not a bean at all and sort it again. Step 5: After yet another cleaning and sorting process (where now the employees are using their hands to pick out any left over debris), the lima beans are put in a freezer kept on average at -29 below for 10-12 minutes. They are shifted again and examined by-hand before they are boxed and shipped out of the plant. As you can tell, your lima beans, corn, and spinach were well taken care of by the good people at Hanover before being sold at the local Giant or Acme. While it was hard to top the mind-boggling experience at Hanover, the rest of the trip was a terrific learning experience for everyone. The group stopped briefly at Fifer Orchards in Wyoming, Delaware to experience their oh-so-delicious apples and apple cider and then ate a scrumptious lunch at Blackbird State Forest. 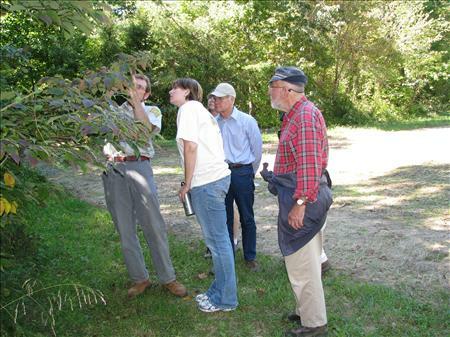 Kent County Forester Bill Seybold gave a wonderful presentation on the creation of Delaware State Forests and took us on an informative tree identification walk. We finished our the day with a stop at Woodside Creamery for a tour of the facilities and some yummy ice cream. All-in-all the day was exhausting and exhilarating at the same time. However, we learned an important lesson in humility and gratitude for our local farmers who work 365 days a year without a weekend, spring break, or summer vacation. Kent County Forester, Bill Seybold, identifies a variety of trees in Blackbird State Forest. In a State that has seen a dramatic increase in development, this tour enlightened us to the critical need to preserve our precious farmland so that future generations will also have access to locally grown food in their grocery stores. Despite the current economic crisis, the Delaware Nature Society feels it is important to continue to advocate for increased funding for farmland preservation. If you are interested in helping DNS seek increased funding related to farmland preservation or would like to become more involved in our advocacy program, sign up for our “Voice It!” alerts by going to http://www.delawarenaturesociety.org/advocacy.html. 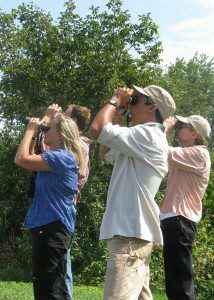 Scanning the skies at Ashland for birds, butterflies, dragonflies and other "things with wings" that come by. Photo by Derek Stoner. If you’ve looked up at the sky during the past week, chances are good you’ve seen a bird flying. The spectacle of mass migration is a key event of fall, and not to be missed. The battle between summer and fall tipped heavily in favor of autumn last weekend, as a cold front streaming down from Canada pushed a wave of birds southward. Then this weekend, another front brought yet another fusillade of feathered travellers. Scanning the skies can turn up a lot: Monarchs, Green Darners, falcons, swifts, airplanes, and plenty of wayward helium balloons! These blasts from the north ushered in hundreds of Canada Geese, Tree Swallows, warblers and other neotropical migrants, and an impressive array of dragonflies. And of course, the raptors. 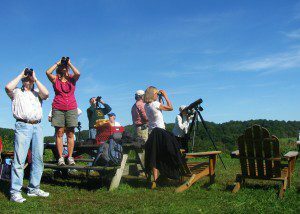 For the past week at Ashland, it was difficult to swing the binoculars without hitting a Broad-winged Hawk. Over 8,000 of these raptors were observed during the last week! 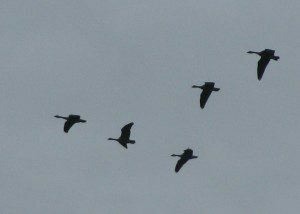 The familiar V-shaped flocks of Canada Geese are once again gracing our skies. 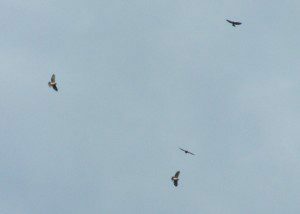 Just another few Broad-winged Hawks heading to South America. Animal populations are at their highest of the year, and migratory birds, insects, and bats are moving on to favored wintering grounds. The efforts of sky-scanning are rewarded by the discovery of all manner of flying creatures. Who knows? Perhaps even Superman will be spotted some day! 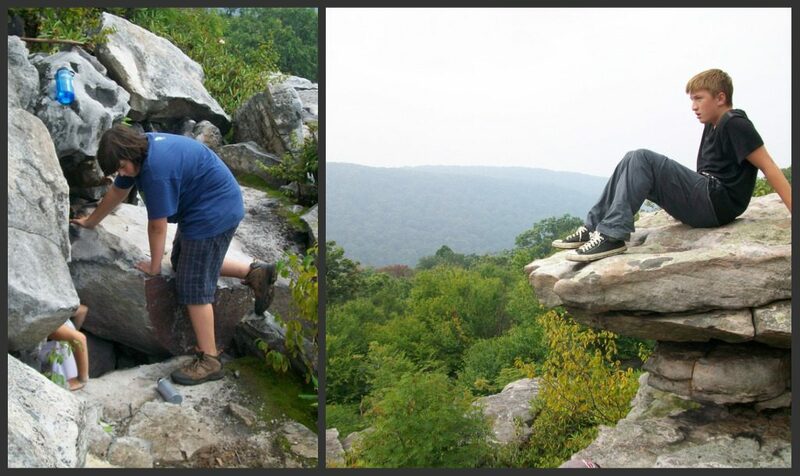 On August 10-14th, the Delaware Nature Society Laurel Highland Adventure camp explored Ohiopyle State Park and nearby areas in southwestern Pennsylvania. Instructor Austin Gee and I led a team of ten ranging from 11 to 15 years old on a fun-filled week of caving, rappelling, hiking, white-water rafting, and other action-packed activities. Starting out with thunderstorms and rain during the first two evenings of our stay, our first two afternoons were filled with fun, floating down a natural waterslide and swimming in the Youghigheny River. The natural waterslide in the state park had been carved out by the flowing water creating these smooth rock flumes, where you can slide down and land in a pool at the end of the slide. In the pool, there were areas deep enough for the kids to jump off into the pool. Jumping off the rocks was the popular activity of the day. 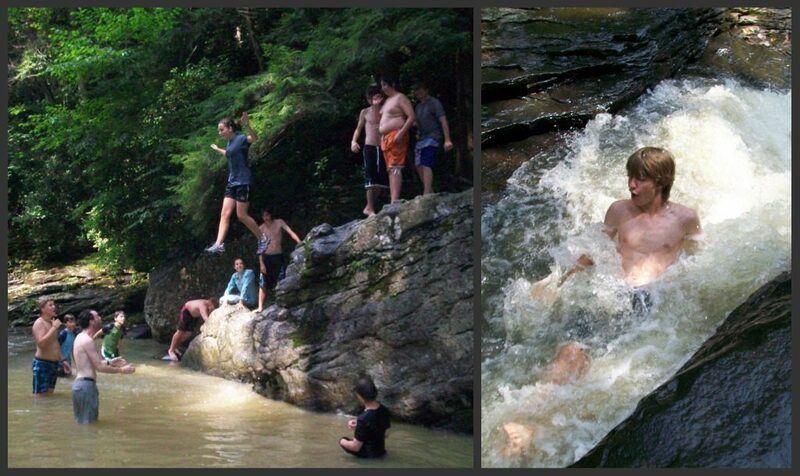 Campers got to slide down the natural waterslide and jump off rocks into pools. On Wednesday, the Laurel adventurers traveled to Powdermill Nature Reserve to watch researchers capture, band, and release migratory bird in the morning. That afternoon we hiked in Laurel Summit State Park. When we reached the end of the Wolf Rocks trail, the overlook was stunning and a small cave was fun as we crawled through the tight crevices. Thursday, was our last full-day of adventuring. White-water rafting was our biggest and WETTEST activity of the day. The campers woke up early in the morning and headed over to Laurel Highland River Tours for training and prep before we took no the Youghigheny River. 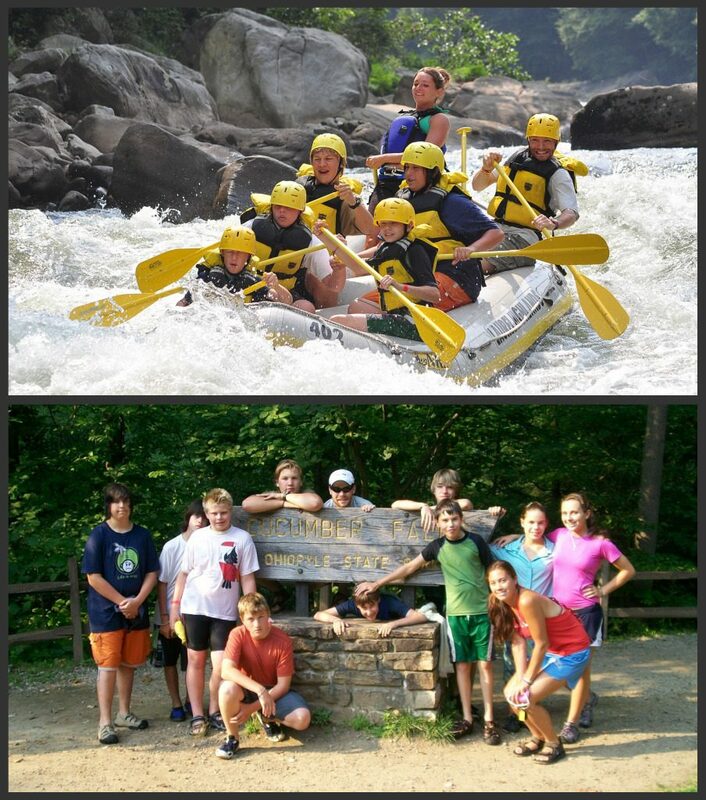 We had a blast taking on and conquering the Category 3 and 4 rapids. We finished the journey a few hours after lunch and then hung out and swam at Cucumber Falls. White-water rafting and swimming at Cucumber Falls. This trip was by far, the most action-packed, fun-filled, and amazing experience for both the campers and the instructors. This adventure could not have happened without the trust, cooperation, and teamwork that these kids and instructors expressed for one another for a safe and fun-filled camp.